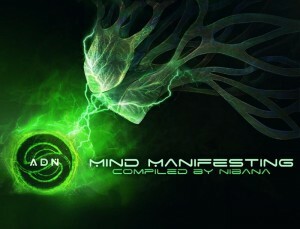 ADN Music is proud to present Mind Manifesting, the first compilation made by the French producer Nibana. The term “psychedelic” is derived from the Ancient Greek words psuchē (ψυχή: psyche, mind) and dēlōsē (δήλωση: manifest), translating to “mind-manifesting”. Explore the mind manifestation with fifteen tracks in three different styles of psychedelic trance: progressive, darkpsy, and hi-tech. All reality creation begins from a place of being. Proper mastering made by Charles Zoltan with artwork by ADN’s producer Fx23. MP3 Download | FLAC Download | WAV Download · Download count: 17,449. Thank you with all energy, we thank you also for sharing sound here at ektoplazm, free downloads is the truth!!! #1 Monthly ! Thanks all for your awesome support ! I had so much fun & happiness with this compilation ! It’s just the beginning ! Love, Psy & light ! Quality release! Thanks Nibbana and everyone involved! I would like to inform you all you guys that the track i have in this compilation is actually Nazrael VS Zaiklophobia. I mentioned it to the label but they didnt respond or make a comment or correct it. So i think is fair to mention this for my friend Zaiklophobia. Thnx for the support… Boom!! Super Chingonas las rolas, todas ellas, sin ningún desperdicio. ¡Salú! Holy balls, this is awesome!! !